Guess who's coming to dim sum. 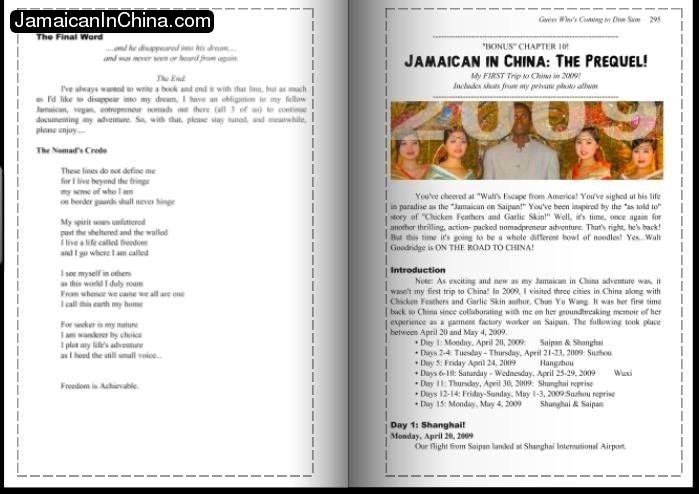 Use any of these links to download the full-color, PDF edition of Guess Who's Coming to Dim Sum: the Jamaican in China, my entire China adventure from the blog, but in book format including bloopers, outtakes and stuff not on the blog! It's a big file, so give it time to download depending on your internet speed! 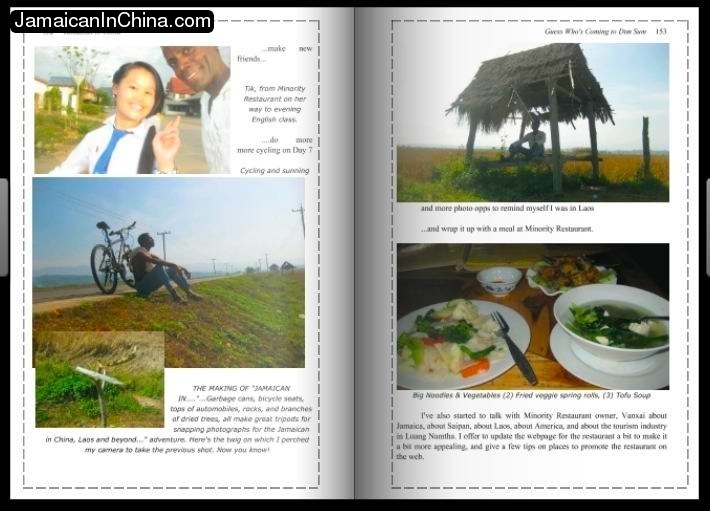 In 2011, I returned to Saipan after spending six months in China, Laos and Singapore! It was an adventure the memories of which will last a lifetime! 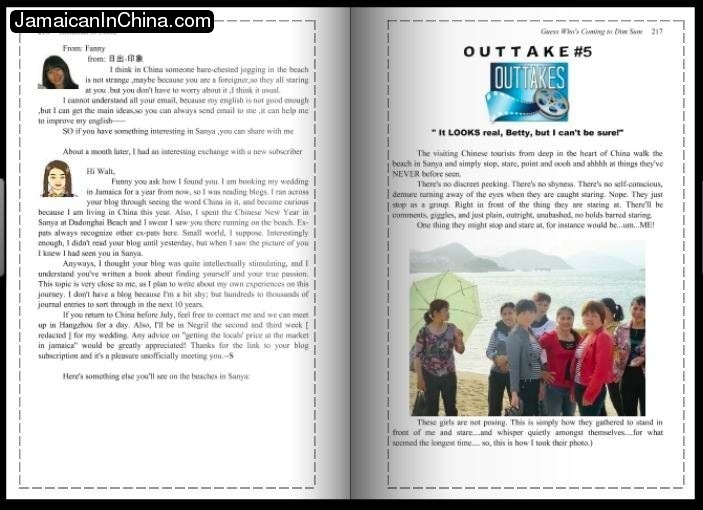 After following the adventure on my blog, a few people wanted it have it all in book format. So, I created a Kindle and Nook versions. However, that wasn't enough! They wanted a paperback copy to carry around with them and to share with their friends who didn't have those "new-fangled" Kindles or Nooks. Other people wanted it in paperback so they could re-live the adventure while relaxing on the beach or in the park away from radiation-emitting computer screens and technology. They simply wanted to enjoy immersing themselves in a fun story the old-fashioned way: by turning pages and feeling the weight of a real book in their hands. Well, I can deny them (and you) no longer! 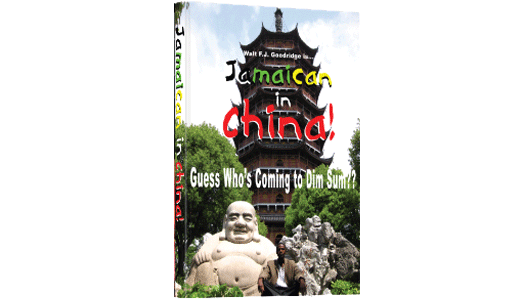 Therefore, as of just a few minutes ago, on the Amazon.com website (or directly from me), you can get the 340 fun-filled, fact-focussed, freedom-fostering pages of my 6-month Jamaican in China experience in Jamaican in China: Guess Who's Coming to Dim Sum, THE PAPERBACK BOOK! THE 2009 ADVENTURE! "The Prequel"
IMPORTANT: Make sure you order the version you want. There is a color version (1) and a black & white version (2). "Once upon a time, there was a Jamaican civil engineer living in New York who hated his job, followed his passion, started a sideline business publishing his own books, made enough money to quit his job, escaped the rat race, ran off to a tropical island in the Pacific, and started a tourism business so he could give tours of the island to pretty girls every day....and live a nomadpreneur's dream life." I also wish to thank those special people in Parts II, III and more in my life: Reina Joa, Christine Karmo, Kenneth McRae, Joe Hill, Angelo Villagomez, Chun Yu Wang, Preeyaporn P. Jompeang, Ron McFarlane, Ashley Moffatt, Ernest & Kim Capers, Monica Afesi and Aaron & Stacey Spencer-Willoughby and the usual recurring cast of main characters in this and previous lives. "I have to agree with the previous viewer. This book definitely grabs your attention. 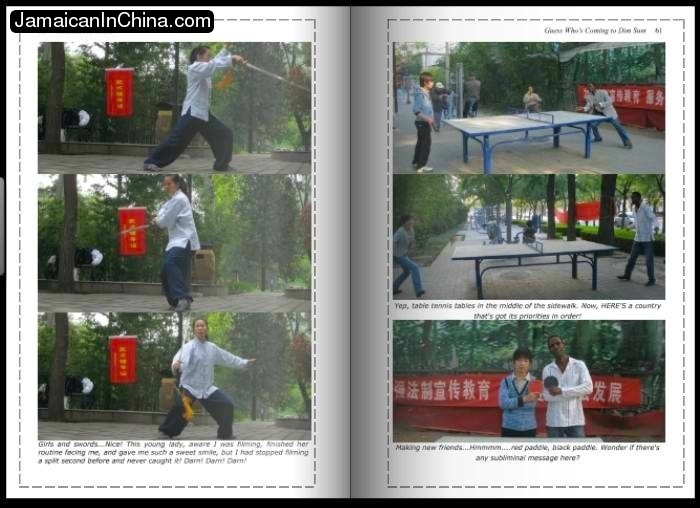 I would say it is also an excellent guide for foreign travelers in Asia. Eventhough this was not his intention, Mr. Goodridge well written tales of travel give an excellent insight for others to follow, such as what to expect, what to look for, perceptions etc. 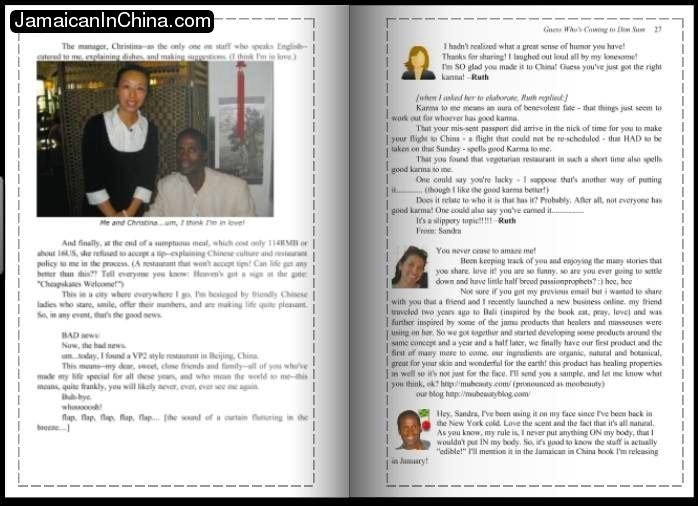 Speaking of perceptions,Goodridge enthusiastically describes Chinese impression and traveling while Black. 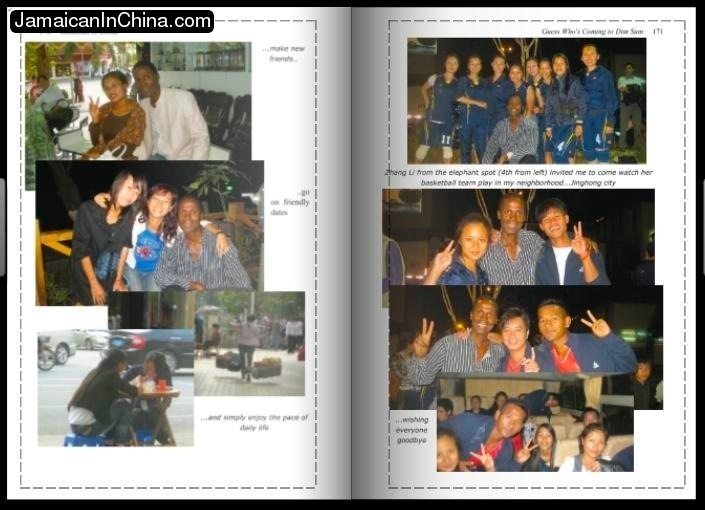 It should be more appropriately called Traveling as a Black Man in China as the author goes to great length about Asian women loving black men either as "friend" or potential lover. One would think this is an Ode to Asian Women. It is not though. Do not let this deter you. Everyone young or old, male and female can gain from such candor conversation. As it has helped me in my blossoming Blasian relationship. The author documents his wanderlust with beautifully captured photos along the way. Which includes funny blog notations and answered questions. The reader is treated to the perfect antidote for cooking on the go called Coffee Pot Cooking. I wish Walt Goodridge continued success. One can clearly see true happiness living abroad." --DameOrchid, El Paso, TX.